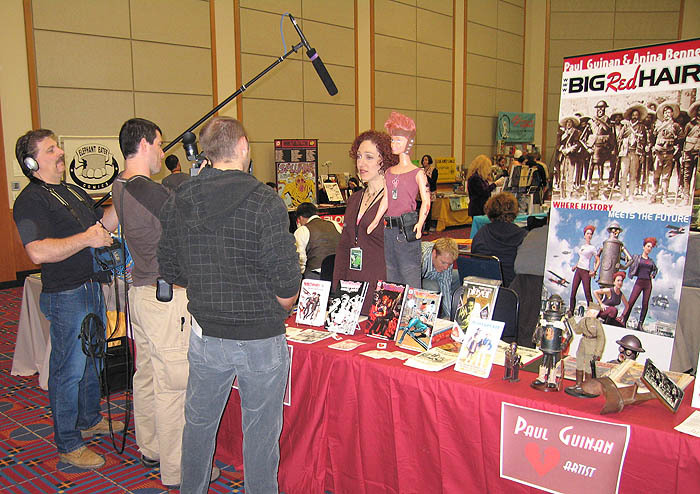 Above: Anina’s weekend of TV mini-stardom began when this crewPatrick, Daniel, and Justinshowed up to interview us at the Stumptown Comics Fest. They’re shooting a documentary TV episode about Wonder Woman fans, specifically Anina and our friend Andy Mangels. Above: Check it outproduction stills from our HOUSE! Cool! This is Anina’s master interview, which will be intercut with footage of her collection, us at the convention, us walking our dog, etc. The crew came to our Halloween party too, but they didn't shoot it. Above: The extremely enjoyable end of our ka-razy weekend: dinner with DC Comics bigwig Bob Schreck (who flew in from New York just for our Halloween party) and Shannon Stewart from Missing Link. We finished the final TV shoot just in time to meet up with them. It was the perfect way to wind down after a WILD WEEKEND.